Few areas in the house offer as much opportunity for personalization, flamboyance, outrageousness, or all out decortropia than bathroom picture walls. If it’s your bath — one you use every day — then it’s easy to know whether bathroom picture walls should offer comfort or visual stimulation. 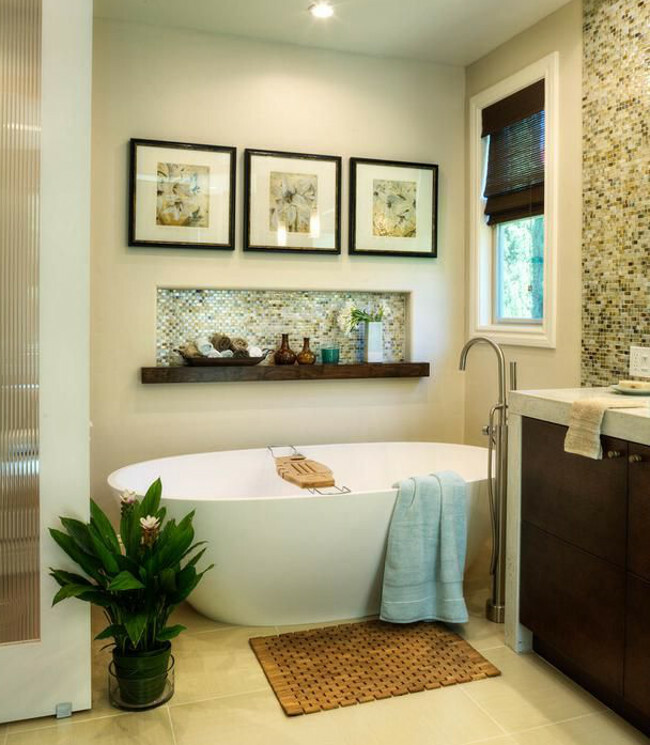 In a guest bath the issues can be slightly more complex because either you’re using images you already own, or acquiring them for a certain effect. Each bathroom presents special issues for picture walls. First, there’s moisture from a shower or tub. Additionally, there can be tile patterns, broken up walls, oddly shaped blank walls, narrow spaces and problem windows to consider. So careful planning with attention to size, shape and image type and quality is beneficial. In addition to their decorative value, bathroom picture walls can help offset visual issues in a various ways, as these bathrooms illustrate. Charcoal gray walls and java finish on a wood floor create an intimate and sophisticated dark bath [top]. White-painted baseboards and ceiling act as frames and tie in the white commode and sink. On the far wall, bold images are staggered and hung floor to ceiling. White frames give each piece a color block effect — so they pop — and size creates a hierarchy of importance. The eye is meant to first notice the largest pigeon, then be drawn down to the smaller one. Below those two, there’s a crazy brain diagram along with the black and white letter C. Quirky no? 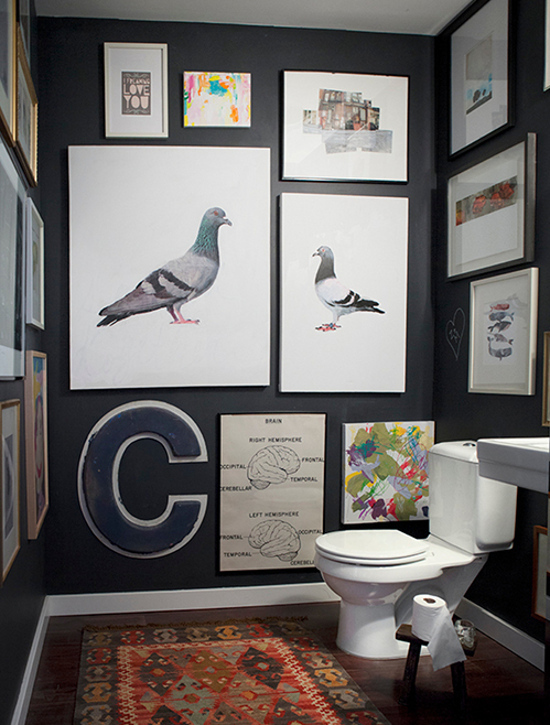 Hanging pictures above the toilet and on the long wall opposite keep the look consistent overall. And the oriental runner adds subtle color to soften the high contrast black and white theme. The central idea here is dark walls and this very personal bath has great personality and a sense of humor as well. 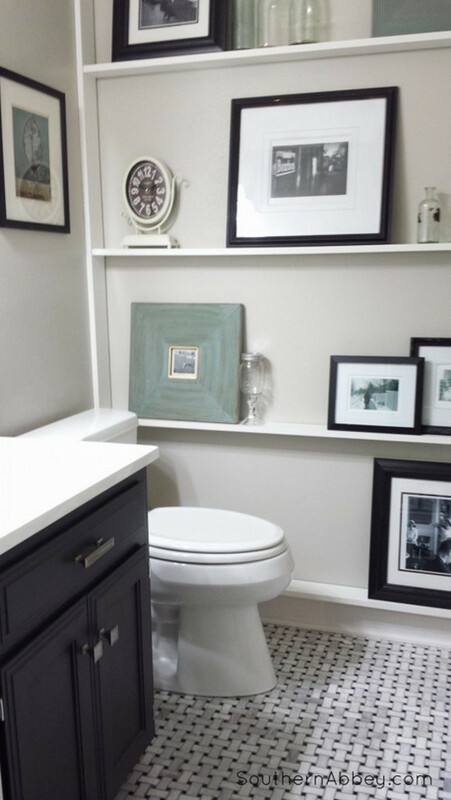 Sweet, simple and screamingly DIY, this bathroom picture wall overs a budget approach. A shallow shelving grid built out over the baseboard allows the owner to display objects and prop up framed pictures in a studied arrangement. Straight from the Pottery Barn catalogue, the look is great for someone who loves styling and wants to play with, or change, the display. The downside is that items could fall since they are not fixed to the wall. Black picture frames with white mats echo the black and white marble herringbone mosaic in the floor and the verdegris accent color harmonizes without disrupting the main theme. For me, this is a more peaceful and comforting arrangement that the dark bath (above). While it lacks flair, it offers a practical solution to displaying objects and pictures in a bath and has a youthful charm. The style of the sanitary fittings and plaster walls indicate a European origin for this bath. The heating vent at the top of the wall reads ‘old building.’ Additionally, this is such a narrow bath there is barely room to pivot — an exceptionally shallow sink is proof — and it lacks room for a counter or shelves. 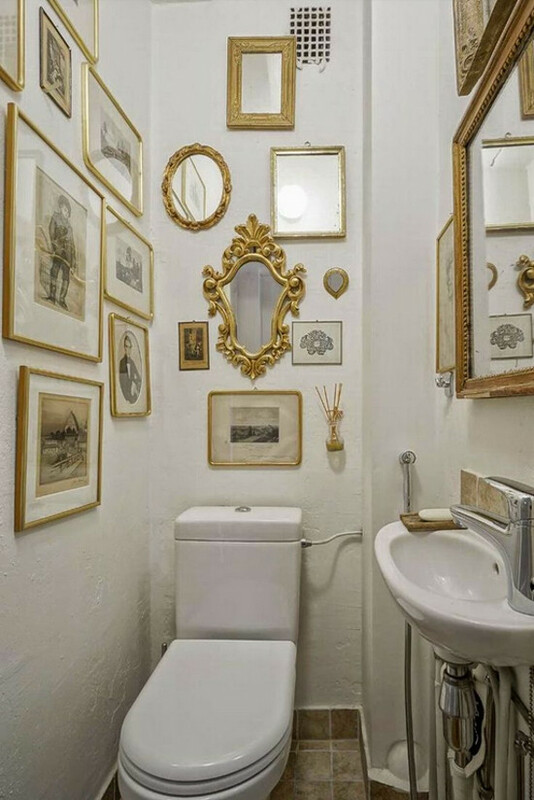 Gilded frames are the theme, carried through to the mirror over the sink. For me the mix of pictures, etchings and small mirrors is a bit vertical on the toilet wall. But the shield-shape mirror is an eye catcher and surrounding objects enhance it. Something more horizontal might give the illusion of greater width but each of the flea market pieces are charming and the vintage look is one way to offset really ugly fixtures and a difficult space. Some might find this powder room, by Denver designer Terrie Hall, to be heavy and a bit 19th century mansion-y. The Victorians loved clutter. Where do you look first here? The walls? The vanity? The floor? Converted from a walk-in closet of guest bedroom, this bath revolves around surface treatments for impact. A slate mosaic tile wainscot, bordered with bronze and glass tile squares, sets the tone. I’m not a fan of the pebble floor, which I find oddly off here. But this is a good example of a guest bath designed to impress with picture walls that promote a sense of a family’s history. 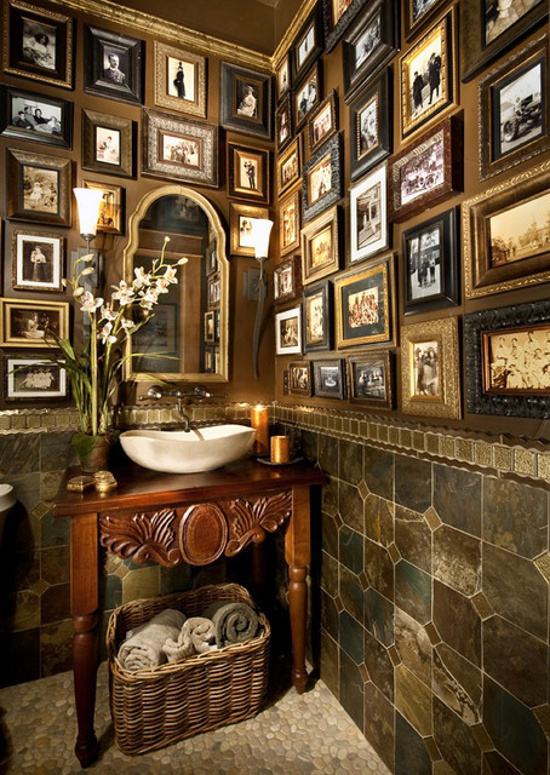 Closely hung vintage photographs, copied from a family album, are displayed above the tile rail in a variety of elaborate frames which the designer sourced from Hobby Lobby. The hand-carved mesquite sink base is a Mexican piece that and the undulating modern vessel sink on top lightens it up. But overall, the dark looks reads as masculine and goes for a robber baron look created with budget-wise finds. Variegated mosaic tile, and a prominent horizontal niche over the tub, are hallmarks of mid-20th century modern style that has become a basic home décor look. But horizontal is not always easy. While the shelf is well sized in relation to the contemporary free-standing eggshell bathtub, there is a yawning empty space above it begging to be filled. One doesn’t notice that immediately because of the skillful way a trio of framed pictures is hung over the shelf. Those help balance the wall, fill in the blank, and draw attention away from the ugly window made uglier by a dark Roman shade. The way the tile ends also bugs me, but no matter. The picture wall creates a focal point in this bath and solves a problem that will no doubt crop up in many other homes built between in the U.S. between 1940 and 1980. Fixtures are prominent in an attractive cocoa-colored bath with luxury hotel styling. 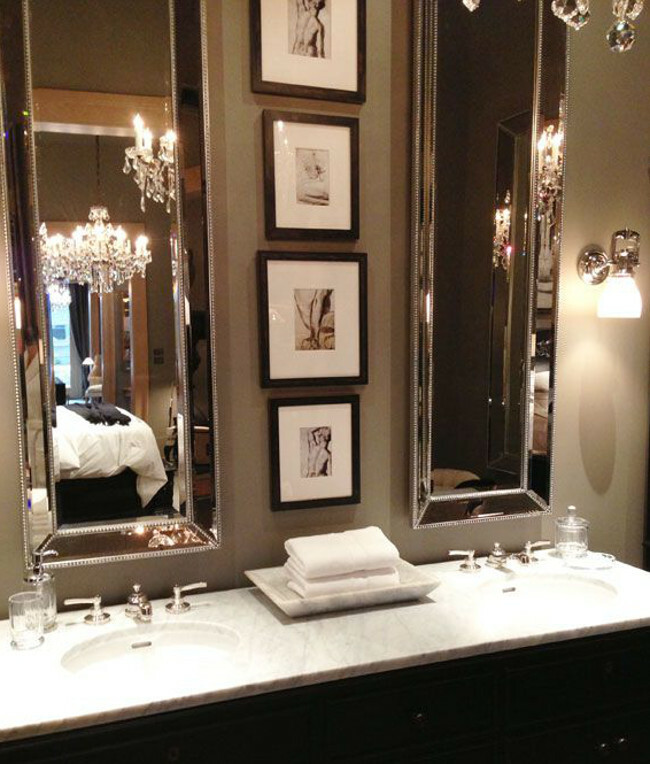 In addition to the handsome pair of vertical bevel-frame mirrors, there is a lovely marble-topped double vanity with Waterworks faucets and gleaming contemporary sconces. With all the glitz you wouldn’t think a picture wall would work. But this one — with framed sepia images alternating in size— fills the empty space between the mirrors. It’s a very clever arrangement that successfully decorates an awkward stretch of wall. Another narrow powder room is so outrageously bold I wish I had the nerve to go there myself. 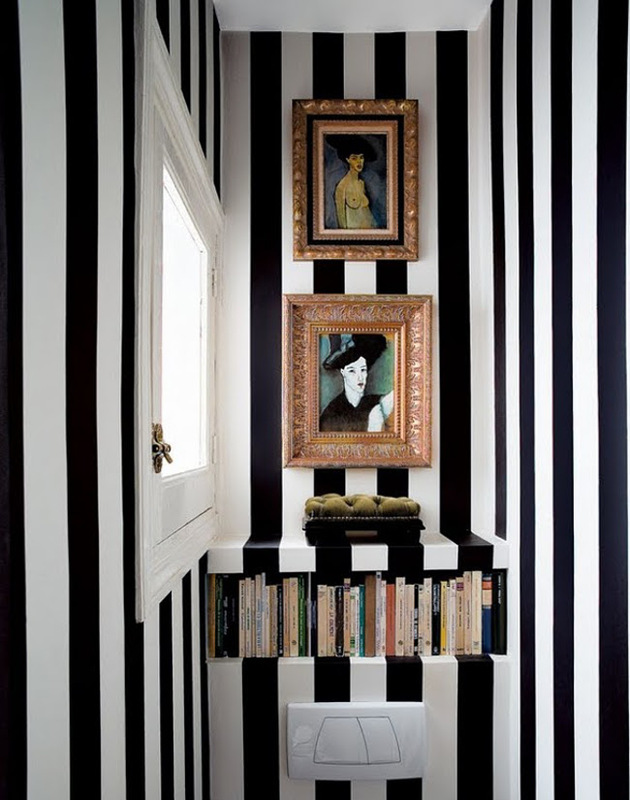 Black and white vertical stripes, painted or papered on the walls, frame the small book shelf over the toilet and act as a vibrant contemporary background for a pair of elaborately framed early 20th century style oils. Each paintings consists of a vertical portrait but the beefy frames help push out the walls. I wouldn’t put oils in a full bath but in this sassy powder room they are a super stylish surprise.